Hike down a long path and descend a staircase to the beach, walk south several hundred yards. DANGER! DO NOT attempt this journey at high tide, or with high tide coming in! This location is officially designated the Devil's Punchbowl State Natural Area. We are on the beach right below the village of Otter Crest, and just north of the Devil's Punchbowl. In the larger scale, we are north of Newport and south of Depoe Bay. 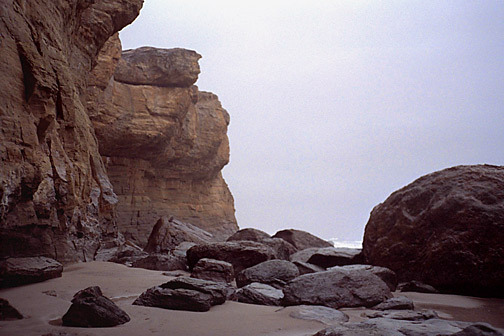 The legendary Captain Cook sighted the high cape just two miles north of here in March of 1778. 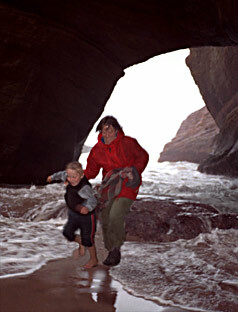 Inside the Devil's Punchbowl is a wind and rain-sheltered grotto, exotic and interesting. It's origin was two sea caves whose roofs collapsed at some point in the past. A tourist overlook is on its upper rim, right next to Mo's West seafood and chowder restaurant. CAUTION. 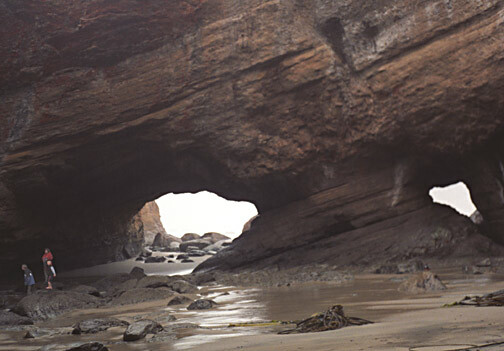 THIS TRIP TO THE PUNCHBOWL'S INTERIOR SHOULD ONLY BE ATTEMPTED DURING VERY LOW TIDES, AND BE SURE TO BE ON YOUR WAY OUT THE MOMENT THE TIDE TURNS. GETTING TRAPPED IN THE PUNCHBOWL WITH RISING TIDE WOULD BE FATAL-- THERE IS NO WAY OUT ONCE THE TIDE RISES!